By guest blogger David H.
Having worked in shipyards for seven years, I’m familiar with how dirty this type of job site can be. Ship repair worksites and welding surfaces are often filthy with rust, dust and other contaminants. Even in shops and yards where fabrication is ongoing, cleanliness is often lacking. 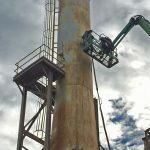 If fabricated or refurbished pieces are being installed onboard, the surface to which the piece will be welded could be rusty, coated with scale, or have other types of corrosion. 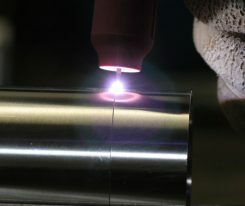 It is hard to overstate the importance of having a clean surface when welding. 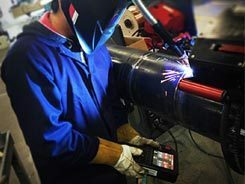 Welds made on unclean surfaces can become contaminated and fail; this is especially true with certain metals, such as aluminum, and certain types of welding, such as TIG, but for all welds at least some level of cleanliness is important. There are numerous methods available for cleaning surfaces. The most basic are simple wire brushes and scrapers; these are ineffective beyond removing common dirt and simple surface contamination. Some hand-held tools, such as grinders and reciprocating needles are slightly more effective. A surface that is properly prepared by blast cleaning can help you ensure fewer problems with weld quality. Deeper cleaning processes can help to ensure high-quality welds. This is particularly important where a failed weld could be costly or create shipboard dangers for the crew. For corroded or contaminated surfaces something stronger is required. Some of the best systems available are blast cleaners. Red-D-Arc has a number of blast cleaning rental options. Dry-ice cleaning systems are environmentally sustainable, non-destructive, and use inexpensive, readily available dry-ice pellets. Recycled glass systems, which reduce dust by as much as 95% compared to dry-blasting, are available too. 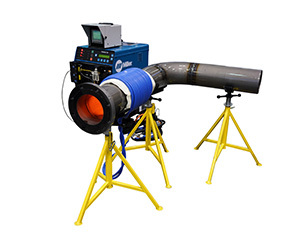 Take a look at our selection of rental blast cleaners which can powerfully clean up the dirtiest weld surface. 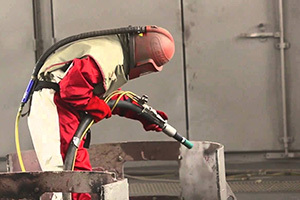 A surface that is properly prepared by blast cleaning can help you ensure fewer problems with weld quality.